It’s a toss-up between Vertigo and Rear Window. Yes, both Hitchcock, and both very acclaimed, but I just didn’t find either of them that impressive. Since we’re working our way through the AFI Top 100 List, I’m going to use the first 10 movies on that list that I have not yet seen. They are: Lawrence of Arabia, The Graduate, On the Waterfront, Sunset Boulevard, Bridge on the River Kwai, Some Like it Hot, All About Eve, The African Queen, Psycho, and Chinatown. 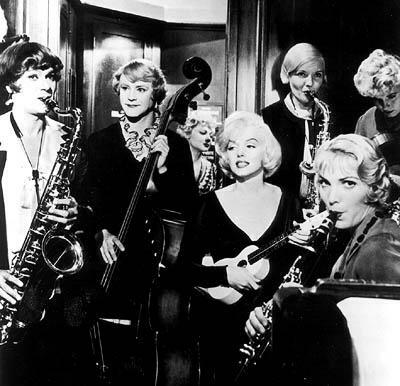 I’m most excited about Some Like it Hot! I actually don’t think so. One movie at a time is usually enough for me. It’s entirely possible I’ve snuck into the tail end of something I’ve already seen, though. Ooh. 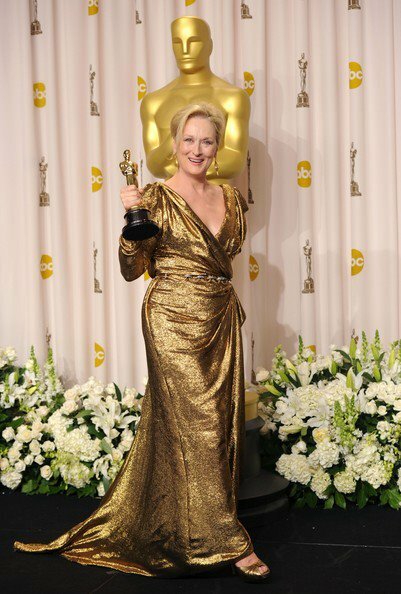 Ladies first: Meryl Streep. I’m not saying she’s not good, but I just don’t think she’s as much of a chameleon as, say, a Cate Blanchett. 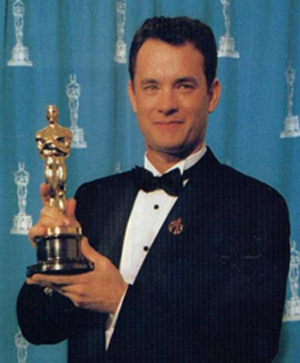 I suppose for actor I’d have to say Tom Hanks, for very much the same reason. He’s a good actor, but I just always think he’s himself, you know? I’ve never seen any Kurosawa. That’s not entirely true; I’ve seen a few scenes from some of his Shakespeare adaptations in a class, but I haven’t sat down to watch a full movie. I guess there’s not really any particular reason beyond the fact that I’m just not that interested. I prefer my movies fairly accessible. Having said that, though, I do plan on watching some Kurosawa at some point. 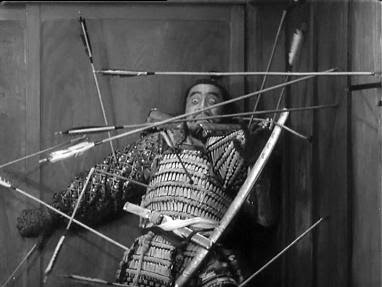 I figure with the Shakespeare ones I’ll at least know what’s going on, so I’ll probably start with Throne of Blood. “Hated” is a strong word. I loves me some rom-coms, particularly some that get a lot of flak from others in the movie blogosphere, like Notting Hill, and some that got bashed by critics, like A Good Year. I hope not, but probably to someone. I grew up as a performer, so audience etiquette has always been important to me. Pretty much anything Robert Downey, Jr. made prior to the year 2000 qualifies, I think, with a few notable exceptions. The Pick-up Artist was pretty unimpressive. But I am still in the process of being inclusive when it comes to RDJ, so there you have it. No. That’s no reason not to watch something! Here’s the thing: I don’t buy a lot of movies. If I buy something, it’s because I think it’s awesome. 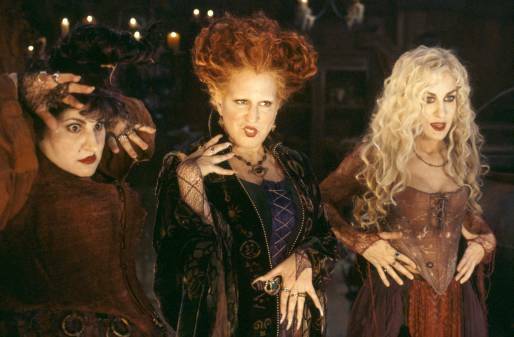 That said, I love the movie Hocus Pocus, and I got tired of trying to track it down every Halloween when I had the urge to watch it. I also own a copy of The Silver Brumby, which is this weird, really early Russell Crowe movie involving horses, because it was part of a video store liquidation, and I felt like I couldn’t just leave it there. This came up recently on Facebook: we still have a VCR. I have a lot of the classic Disney movies on VHS, and I refuse to give Disney more of my money just to “update” to DVD. That’s a total racket. Also, we watch a fair amount of older movies, some of which aren’t actually available on DVD. We don’t have a Blu-Ray player, either. Can’t think of anything, but if you’ve got something you’re just dying to know, ask away! A couple of weekends ago now, we watched our very first Buster Keaton movie. I think that we can safely say that the AFI project has truly expanded our horizons: I would credit our enjoyment of contemporaneous works (I suppose I mean Charlie Chaplin) with raising interest and awareness of similar films. Much like Chaplin, Keaton dealt mainly in silent film and physical comedy. Apart from that, I’d say the two are markedly different: Chaplin was, I think, more of an actor, and Keaton, at least from the one film I’ve seen, is less emotive and more physical in conveying sentiment. I will absolutely have to watch more of Keaton’s work before I get carried away with making comparisons, though. I think The General was a fabulous place to start. At the start of the American Civil War, Johnny Gray (Keaton) is a railroad engineer. He has, we are told, two loves in his life: the lovely Annabelle Lee (Marion Mack) and his engine, The General. The former declares that she will never speak to him again after he fails to enlist in the Confederate Army, but when both The General and Annabelle are made off with by Union spies, Johnny engages in a daring solo mission across enemy lines to rescue them, and to aid the Southern cause by warning them of the North’s plans. The General is largely considered to be one of Keaton’s greatest films, and it’s not hard to see why. Although it’s a little slow to get started, once the main plot kicks in, the movie is a riveting piece of film-making. Keaton is an amazing physical presence, and his every move belies intense preparation, precision, and ability. The action sequences that make up about 80% of the movie mirror that dedication and imagination, and could probably only be imitated today with the use of CGI. Keaton relies less on slapstick humor than Chaplin does, preferring to use his physicality in more athletic ways, which makes the comedy of The General more sophisticated than much of Chaplin’s work, but no less funny. Please note that I am not suggesting Chaplin wasn’t sophisticated: I think Modern Times is some of the most amazing satire ever. There’s just something a little smoother about Keaton’s work: his Johnny is still a bumbler, but he errs in more interesting ways. Again, it’s his precision that impresses. 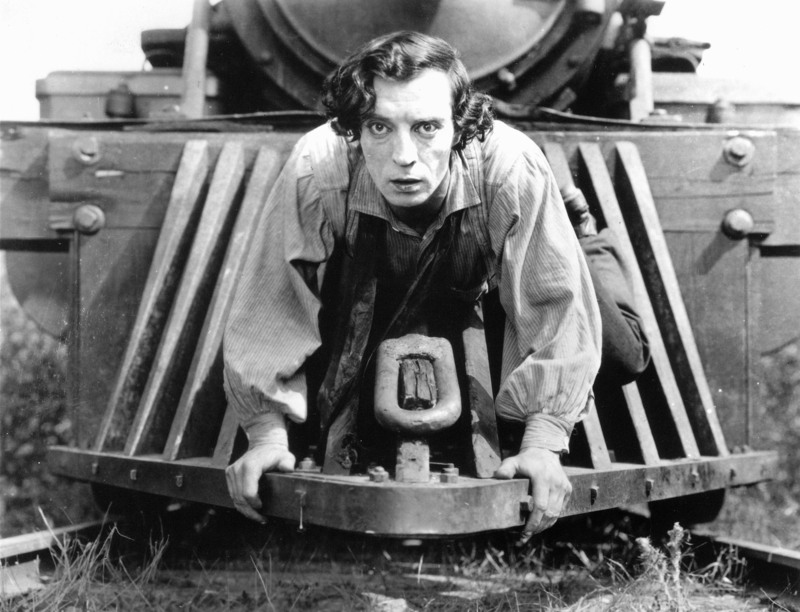 The character is also well-suited to Keaton’s trademark “straight-man” qualities: he’s dogged in his determination to rescue his beloved engine; anything else that comes his way is secondary to his primary goal He’s momentarily bewildered but soon reaches a solution to the problem at hand, and moves on. Any time a performer can carry a large portion of a movie completely alone and still maintain interest, you know you’re dealing with something special, and that is definitely the case here. It was entertaining to watch an early comedy about the Civil War, having seen D.W. Griffith’s The Birth of a Nation not too long ago. I would definitely say that The General is a superior movie, and not just due to Griffith’s obvious biases. The General focuses more on the aspects of the war itself rather than the social and political reasons for that war, and it finds a way to make light of it. This was a really great watch that I would recommend to anyone looking to broaden their horizons a little bit. If, like me, you get a lot out of watching someone be really good at what they’re doing, I think Mr. Keaton is the man for you. Overall, The General is a marvel of construction as well as laugh-out-loud funny. 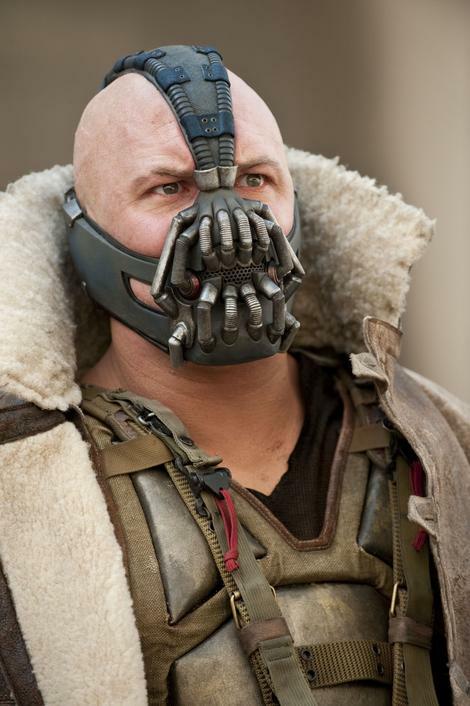 8 reasons I am not interested in The Dark Knight Rises. 1. Because Anne Hathaway and Marion Cotillard are both in a Batman movie, and Hathaway is the one playing Catwoman. 2. Because Christopher Nolan should be making original movies instead of comic book rehashes. and made him look like this. 4. Because I like my super-hero movies fun, and not full of angst-ridden socio-political commentary. 5. 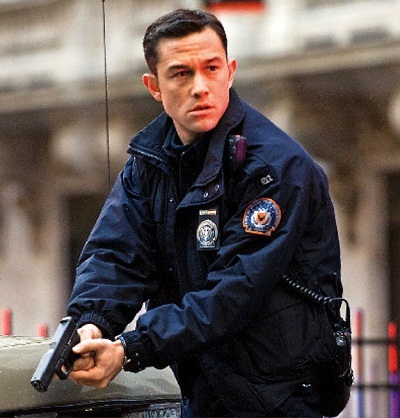 Because Joseph Gordon-Levitt looks ridiculous in a policeman’s uniform. 6. Because I thought The Dark Knight sucked. 7. Because of trailers in which you can’t actually understand what the bad guy is saying. 8. Mainly, because I don’t think a Batman movie should take itself so seriously. I’m just going to go ahead and get this out the way first: I’ve never seen Alien. Or any of the Alien movies. I know, I know, right? We didn’t do a lot of scary movies in my family, and I’m not really very big on scary/gory/horror in general, so it’s just never been a priority. I was actually all set to watch it before Prometheus, but then I decided it might be interesting to go into it with a slightly different perspective. So, you should stay tuned for future developments; I’ll probably get around to Alien in a week or two. For now, Prometheus! 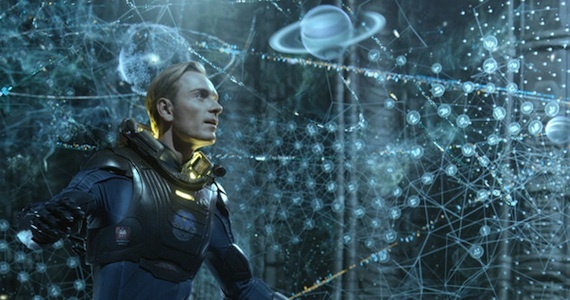 One of the most anticipated movies of the summer blockbuster season, Prometheus was touted as an “is it or isn’t it?” prequel to the Alien franchise. As I understand it, the stories are not directly related, but the events of Prometheus do a certain amount to set up the plot of Alien. Guess I’ll find out later. Elizabeth Shaw (Noomi Rapace) and her partner, Charlie Holloway (Logan Marshall-Green) are anthropologists who have made a startling discovery. Ancient civilizations all over the world have depicted the same incident in their artwork: humans worshipping a larger humanoid figure, alongside a specific configuration of stars. Shaw and Holloway believe that the images are an invitation and a roadmap left by the creators of humanity. They convince Weyland Industries to fund an expedition, and are soon waking up from a two-year-long nap aboard the ship Prometheus, having reached their destination. Along for the ride are a handful of other scientists, the ship’s crew, Meredith Vickers (Charlize Theron), Weyland’s representative, and David (Michael Fassbender), the ship’s android butler. Upon landing, they quickly find signs of the civilization they’re looking for, but the “engineers,” as they have dubbed humanity’s creators, appear to be long dead, and it’s not very hard to guess why. As you might expect, things go downhill pretty quickly from there, and Shaw particularly is left with more questions than she had previously. I want people to know that I actually enjoyed the movie, although I am really unclear as to why. The basis of the story is a pretty interesting one, certainly, but otherwise the plot seems to function mainly as a bare-bones means of moving from event A to event B and so on. 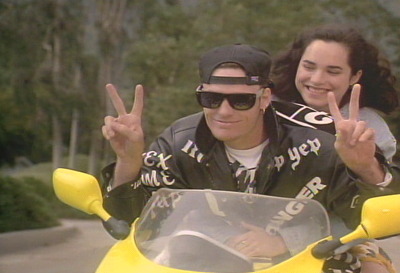 This movie has no pacing whatsoever. I repeat: No. Pacing. Whatsoever. Scientists make discovery, then they’re in space. They wake up, they land, they find stuff immediately. All hell breaks loose for the next hour or so, the end. It’s like the writers started out wanting to make these interesting statements about the universe, or whatever, and then they thought “Enh, whatevs, let’s just do a lot of gross stuff and kill some folks off instead.” The same goes for the folks in question. Only two characters get any sort of development at all, and that’s rudimentary at best. A common theme that crops up in discussions about the film is “Why did any of those people do anything that they did?” There’s very little in the way of motivation, probably again because there’s no character development. There’s a subplot that seems like an attempt at explaining a few things, but it mostly ends up feeling extraneous and random. What I’m saying here, reluctantly, is that this is a poorly constructed movie. Ridley Scott has been around a long time and made some really great movies (and some not great ones, too), but Prometheus somehow doesn’t feel like the work of an A-list director. Likewise, the cast is pretty classy (the main reason I was excited about the film to begin with), but the effort feels beneath them, with one, perhaps predicatable, exception. Michael Fassbender does a superb job. His David is creepy, exceedingly ambiguous, and decidedly NOT human. Most everyone else underutilized (most notably Theron), and I found Noomi Rapace to be a less than compelling lead, which was somewhat disappointing. All of that said, I really did (somehow) enjoy it. It’s quite visually stunning, and the lack of pacing keeps you riveted, even as you’re wishing for more intellectual stimulation. It was not as gory, scary, or suspenseful as I feared, although there’s definitely at least one scene that will make you squirm. Overall, it’s a B movie wrapped in an A movie’s clothing. Looks great, has the flashy cast, but doesn’t deliver in terms of being the smart, intriguing film I think most fans were expecting. Whether or not I recommend it is largely irrelevant; I think this is a movie that you either already planned to see, or had no interest in. It seems to have ended up being rather polarizing as well; people either love it or hate it. I guess I can see both sides, although in the final analysis, I’d say I was rather disappointed. 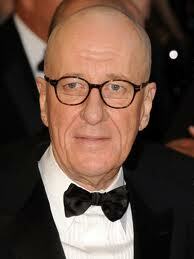 In case you missed it, I’m a huge Geoffrey Rush fan, and today the talented Aussie celebrates his 61st birthday! In celebration, let’s look back at a couple of posts featuring the work of Mr. Rush.